Continuing our series of butterflies spotted at Gardens by the Bay, here is a shot of the skipper Palm Bob by our lady ButterflyCircle member Ellen Tan. The Palm Bob was once considered a very rare butterfly species confined to the mangrove habitats in north Malaysia , but over the past 4-5 decades, has spread throughout the peninsula and discovered in Singapore as a new species in the mid 90's. 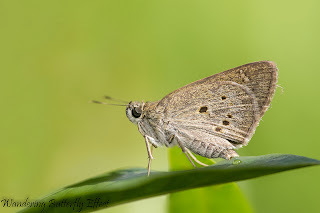 It has become a common butterfly today, and is quite widespread in distribution across Singapore, appearing from urban parks and gardens to forests and mangrove habitats. As the caterpillar of the Palm Bob feeds on a variety of ornamental palms like the Yellow Cane Palm, Lady Palm and Sealing Wax Palm, the horticultural trade in the region may have aided the spread of this species across geographical boundaries in a significant way.